INDEPENDENT CHARGING – Charge any number of batteries, up to 4, with independent setting selection for each channel. Dual Operation Modes - Charge Mode, charges your batteries at the desired current (300-1000 mA). Test Mode, test the capacity of your batteries. SMART INTERFACE – Toggle between informative display options to get accurate readouts of a battery. ADVANCED PROTECTIONS – Automatic shut off to prevent overcharging, overheating, and short-circuit. 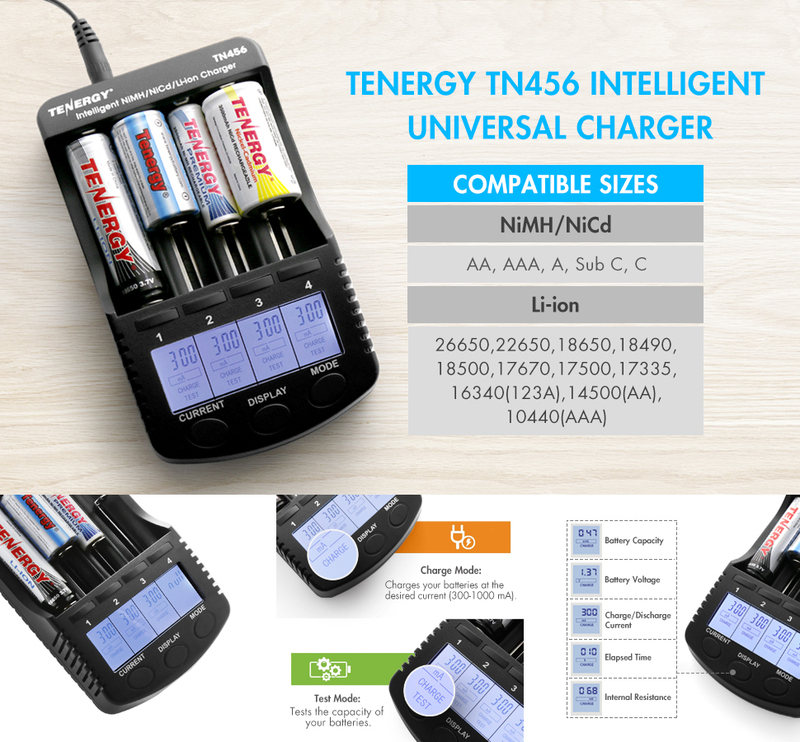 ALL IN ONE CHARGER - The Tenergy TN456 universal battery charger works with different sized cells of NiMH, NiCd or Li-ion. Charge any of these NiMH/NiCd sizes- AA, AAA, A, Sub C, C along with Lithium-ion (Li-ion) sizes- 26650, 22650, 18650, 18490, 18500, 17670, 17500, 17335, 16340 (123A), 14500 (AA), 10440 (AAA). With so many lithium options, feel safe using the TN456 as a Li-ion battery charger. PERSONALIZED CHARGING - With four individual charging slots, the TN456 smart battery charger is not limited by charging in pairs or even same cells. Each charging slot can be personalized to a specific battery to change its settings (mode/charging current). DUAL MODE - Built in are two modes, CHARGE and TEST. The charge mode features current selection (300-1000mA) that allows you to set the charge current for each battery. While the test mode tests the capacity of your battery. SMART DESIGN - With just one button, easily toggle between display options to view charge/discharge capacity, battery voltage, charge/discharge current, internal resistance, or elapsed time. The backlit LCD is visible and easy to read. In addition to charging batteries, TN456 also has a USB port that charges your portable devices simultaneously. SAFETY FEATURES & 1-YEAR WARRANTY - To prevent overcharging and overheating, the household battery charger will automatically shut off. These safety features protect the rechargeable battery but also the charger itself. Backed by a 1-year warranty along with lifetime support from our friendly Tenergy customer service.